Hello, I'm Gregor and I put this site together. 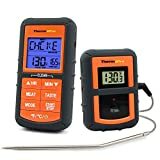 At first, you'll find an overview of recommended bbq thermometers, followed by a public poll and a general buying guide on bbq thermometer. Further down on this page, we do link to other well-written articles and reviews about bbq thermometers. At last, you'll be able to weight in your own opinion in the comments section. If you also want to vote on the best bbq thermometer, click here to view the poll. If you love to barbecue, but your results are never quite what you hoped for, the missing ingredient in your favorite recipe might be a thermometer. Unlike the familiarity of a cooktop, there’s lot of room for error when cooking meat over an open flame. From basic models to newer styles that work with your cell phone, here’s everything you need to know about how a BBQ thermometer can help you grill like a pit master. Do you really need a BBQ thermometer? Unless you are the rare BBQ-savant that can grill perfect meat with your mind, yes, you do. The problem with cooking meat is that it’s dangerous if it’s undercooked and not worth eating if it’s overcooked. The elusive ground in-between is the goal, but because grills heat quickly and the temperature is hard to control, the key to good results is to carefully control the temperature of your meat. The color and texture of cooked meat hint at its doneness, but they’re unreliable indicators of interior temperature. 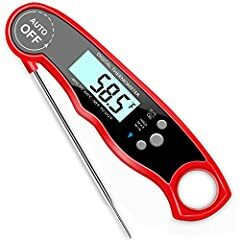 To kill potentially harmful bacteria, meat, poultry and seafood must always be cooked to a minimum internal temperature and using a thermometer is the only way to be sure it’s safe to eat. For poultry, an internal temperature of 165°F is the goal. Pork, on the other hand, has a lower target temperature of 145°F. Whole cuts of beef are comparable and also ready to eat at 145°F, but ground meats need to be cooked to 165°F to make sure pathogens that may have been churned into the meat during the grinding processed are killed. No matter how clean the meat you purchase and how carefully it’s handled, when it’s put on the grill, bacteria and other organisms are likely present. The good news is that heating your meat to the right temperature is all you have to do to prevent illness. Serving charred, leathery steaks isn’t a good strategy. 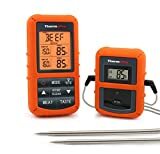 A BBQ thermometer’s most noble purpose is to keep you safe, but not far behind is its mission to help you grill the perfect cut of beef. The trouble with grills is that they get hot — as high as 700°F — and there’s no reliable way to tell how hot the grill really is. What does “medium-high” on your grill’s temperature dial mean? For thin cuts of meat and small items like steaks, burgers, and chops, a quick searing heat cooks them quickly while sealing in juices, but the fast pace means you need to keep a close eye on the grill. Fish and chicken however, are best grilled at lower temperatures for longer periods. If you’re using a gas grill, this means adjusting the temperature down once it’s preheated; for charcoal, it means building a smaller fire. Ultimately, unless a higher level of doneness is your personal preference, meat that’s cooked to the minimum internal temperature is usually perfectly done. It’s safe, but moist and tender. As a general guideline, paying more attention to the temperature of your meat will yield far better results than trying to guess the temperature of the grill. Adding a temperature gauge to the exterior of your grill can help, but its accuracy is only ballpark. 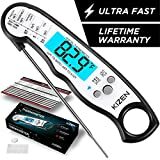 The simplest type of meat thermometer is a single probe, instant read manual thermometer. 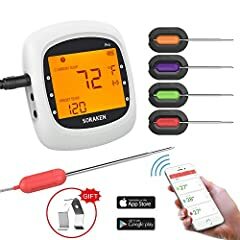 It’s digital and comes equipped with one stainless steel probe that is inserted into meat to determine its temperature. Most models take an accurate reading to plus or minus two degrees in under ten seconds. To check cuts of meat that are irregular or may cook at different speeds such the breast and leg of a chicken, the probe must be inserted separately into each section to test for doneness. 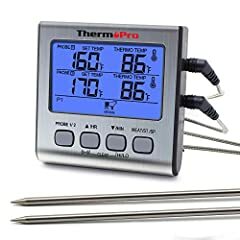 Multi-probe meat thermometers are a little more complicated, but the wow-factor is hard to beat. They come in wired and wireless models and can handle more than one cut of meat at a time. Until recently, two probes were the standard. One, for example, could be inserted into the thick part of a roast, while the other is inserted into the thin end. Knowing when the thinnest part of the cut is cooked can help you better manage the temperature for the rest without having to overcook the whole roast. 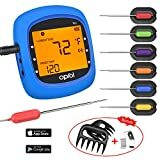 If you’re making both burgers and chops, one probe can go in each and you’ll know when to take one off the grill without repeated testing. New models come with as many as four probes with expansion capability for more. 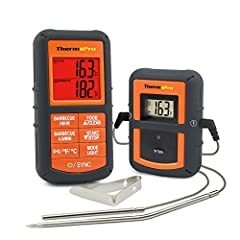 Wired thermometer probes are connected to a digital temperature display panel by heat-resistant wires that can handle temperatures over 700°F. The probes are placed in the meat and the grill cover can be safely closed. The digital display panel sits next to the grill and gives temperature reading throughout the cooking process without having to sacrifice heat by repeatedly opening the grill cover to test. Wireless models work like wired models, but they can report temperatures to the cook from as far as hundreds of feet way through a dedicated, hand-held display or via software that links it to a cell phone or Bluetooth. Cooks are no longer tied to the grill. They can get perfect results, while enjoying other festivities. What makes a grilling thermometer perfect is the blend of convenience features it offers. Consider these top functions. Thermometers made with a selection of timers are ideal for tracking both temperature and time. Set one to alarm when the temperature reaches the desired level and set another to help keep other cooking tasks like the application of sauces under control. The more options a thermometer has, the more flexible it is. 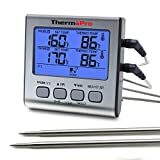 Most thermometers are now made with pre-set functions that ensure meat is grilled to the recommended minimum temperature. How? They’re all programmed into the device. Choose the setting for chicken and the necessary temperature of 165°F comes up — no human memory required. 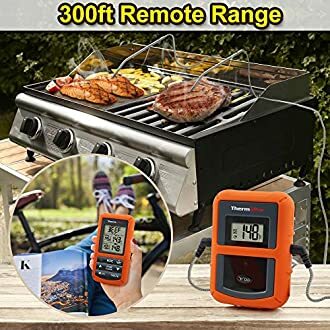 - For grilling outdoors, a thermometer with a backlit display is easier to read. - Wireless models with ranges of at least a hundred feet are ideal. - Make sure the software that comes with wireless models are compatible with your phone. - Button batteries are lightweight and last longer, but regular household sizes are easier to replace. 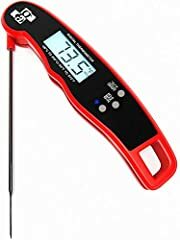 - Check the temperature rating when using with high-efficiency grills. - For wireless models with portable, dedicated displays, a belt clip is a big plus. - Choose single probe thermometers that fold to protect it from damage. - Storage features like built-in magnets are helpful. 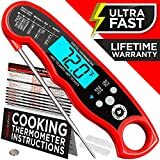 - Waterproof thermometers are excellent for both indoor and outdoor use. - Look for models with long probes for turkeys or whole roasts. - An auto shut-off feature saves battery life. 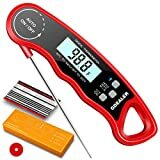 For the occasional gas grill user or for grilling over charcoal with no cover, an inexpensive single probe thermometer will get the job done without breaking the bank. It’s manual, but since there’s no heat loss to contend with, it won’t impair your cooking. Opt for a folding model with a magnet to attach it to your refrigerator. Replaceable batteries and a backlit display are a plus. 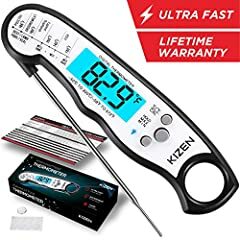 For hard-core BBQ enthusiast, a model with a minimum of two probes is a must. And forget those with a dedicated display — let your phone do the talking! Select a model with compatible software and a range of at least a hundred feet. For cooking in the sun, a backlit display is a must and being waterproof is a an important value-added feature. 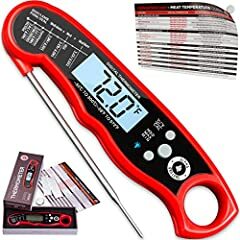 If you’re ready to take your grilling to the next level, a good quality BBQ thermometer is a great place to start. You’ll have the comfort of knowing your food is safe and the capability to impress your family and friends with your expertise and juicy, perfect grilled meats. New: Our editorial list of additional articles. 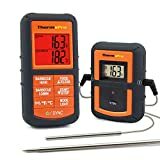 We decided to gather informartion all around the internet and present you a list of helpful, external links to interesting reads about the best bbq thermometers and their reviews and guides. You're not convinced by the previous writings about bbq thermometers? Of course you can just choose by visual impression, that's why we present you all our chosen products at a single glance. A click on any image is enough to open an external link to the best offer we could find. Finally, we want to present you our rating criteria for our bbq thermometer comparison, so you can better understand and comprehend our recommendations and the rating process itself. 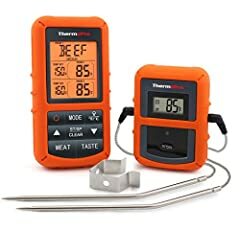 Furthermore, we still ask you to keep your eyes open for short term deals in order to make some great bargains with bbq thermometer in 2019. Published by G. Krambs on StrawPoll.com (last update on 2019-04-18 08:35:52). 15 of 18 readers found this article helpful.